The Irvine Children’s Fund welcomes HOAG as the 2019 Irvine Junior Games Presenting Sponsor. THANK YOU for supporting the ICF mission to provide before and after school child care scholarships to low income, working families. Child care is available on all 27 IUSD elementary schools. 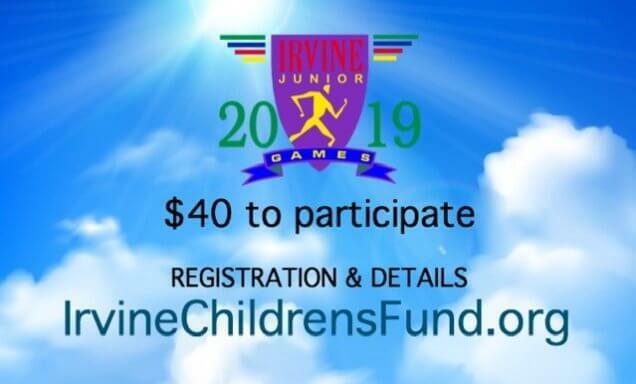 4th – 8th grade IUSD athletes, sign up for the Irvine Junior Games. Click on the Irvine Junior Games page and register today. Thank you, Mariners Church, for your financial commitment to helping families have access to before and after school child care on all 26 elementary schools in Irvine. The Irvine Children’s Fund is very proud to receive a $30,000 HOAG COMMUNITY BENEFIT PROGRAM GRANT to provide Before and After School Child Care Scholarships for low-income, working families. The child care is provided on all 26 elementary schools in the Irvine Unified School District serving children from Transitional Kindergarten through 6th grade. The Irvine Children’s Fund welcomes HOAG as the 2017 Presenting Sponsor for the 30th Annual Irvine Junior Games. THANK YOU, HOAG Foundation, for the $25,000 grant to provide before and after school child care scholarships to low-income, working families. Child care is provided on all 25 IUSD elementary schools for children in Kindergarten through 6th grade. The Irvine Children’s Fund Board of Directors is very pleased to welcome new board member Charisse Redd from HBLA Certified Public Accountants to serve as the ICF Treasurer.